With the upcoming 5.2 version, Matukio will support Boulderado cash software. 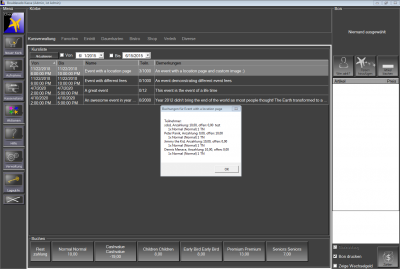 Boulderado is an (german) all in one cashier software solution for the Windows PC. It offers an intuitive interface, making it easy to sell tickets and more at your (local) sites! The integration automatically syncs all events and bookings to Boulderado and vice versa. Making it easy to sell (or just book) events over your website with Matukio and also at your local site! When a new booking is created in the cash software, it is automatically submited to Matukio. Support includes booking confirmation emails, notifications of the organizer by Matukio and more! You can also do a cash payment at the site and Matukio automatically enables the booking and can generate and send the invoice! A bit earlier then planned Matukio 5 is now available for download! Bringing tons of changes and new features to our Joomla events extension. If you are in a hurry and just want to take a look at the new responsive bootstrap 3 frontend visit our demo page! Matukio 5 brings a completely rewritten and improved frontend based on the bootstrap 3 framework. The new design is 100 % responsive and looks great on every device, from smartphones, over tables to large desktops. The frontend is now also completely jQuery based and does no longer need Mootools. And we did not only rewrite the public views, but also the frontend organizer area, so you have a continuous look & feel throughout the whole extension. But it is not only a design update, there are also a lot of new features in the different views! Since the release of Matukio 4.2 we had many minor releases and three major ones, which brought some nice new advanced features and some cool additions. In this blog post we are going to give you an overview about the changes. With Matukio 4.3 we introduced some new time-dependent features, like automatic cancellation or confirmation of events X days before the start or automatic invoices X days after it. For these recurring tasks with PHP you need cronjobs. Cronjobs just execute a script or programm in a fixed rythm, in our case the Matukio cronjobs should be executed only once a day, but you can also set cronjobs to run every X minute or just once every week. Please note: Windows offers something similar with Windows Task Scheduler, but in this post we are going to focus on Linux systems. Depending on your environment there are different ways to setup cronjobs. In Joomla! installations cronjobs are normally stored in the /cli folder and they are mostly normal PHP files implementing the Joomla API.In this first part I am going to show you how to setup cronjobs in an Linux vServer / Rootserver environment. There are, depending on the extension, different approaches for that, we are going to focus on the direct PHP execution.Simple cronjob on a Linux server with direct PHP execution:Login into your server with SSH - you shouldn't execute PHP scripts as root, so maybe it's a good idea to create a new normal user or depending on directory permissions you would like to use the webserver user. After logging into the server type:crontab -eIf you want, you can export your favorite editor (if you haven't done so in for example your .bashrc already) with export EDITOR=nano first - if you aren't familiar with Linux command line editors, I suggest you try out Nano, which is a pretty easy and straight forward cli editor.After hitting enter the editor opens and you see your users crontab file - in this you create the recurring tasks.The syntax is pretty straight forward - your code begins after the comments (the lines with the # at the beginning). It's been some time since we last blogged about Matukio (version 3 in november 2013), but as you might have noticed we've released a lot of new versions since then. We were busy improving the product and neglected the bloging for a while. So, that is why in this blog post I'll try to cover up all the important changes since version 3. That won't be that easy, as the changelog is really long.